What better way to relax after a half-day at work than by going out for Mexican food and the best margaritas in the city? Best margarita had recently been updated and Playa Cabana Hacienda was the new winner, which is fine by me as it is closer to our place. I was not looking forward to the walk, having spent the day before shopping and having walked to work. But I sucked it up and thought of the delicious lunch that awaited me. We had made reservations the website, just in case. We got there and were the only people there- but it was a Friday at 2pm, so that is no surprise. Our server was nice enough to explain what everything on the menu was. He sold me on the daily special: pork being roasted on a grill/spit outside with a pineapple above. I almost stopped him right there, no need to tell me about anything else, just give me the pineapple meat taco!!! After some deliberating we settled on the pineapple meat taco, a jerk lobster taco, braised pork taco and of course: nachos. These were no ordinary nachos however. We each got one tortilla (I think it was a tortilla, I will just assume) with chorizo, mole sauce, cheese and some more sauce. I somehow managed to get the super spicy sauce on the underside of my tongue and it hurt surprisingly. They were a frightful mess to eat, sauce everywhere. The pineapple meat taco was easily the greatest taco I have ever had. It was unbelievably good. So good in fact that rather than picking out the pineapple bits (in fact, I hate pineapple) I actually ate them. Happily. The other tacos were piled high, so high in fact that biting into them became difficult and I ended up with a massacred mess of taco on my plate and resorted to eating with a fork. Brent’s margarita was served with a straw, which rather defeats the purpose of the salted rim. It was indeed a delicious margarita, even moreso because it was not made with crushed ice, it was served over ice cubes. 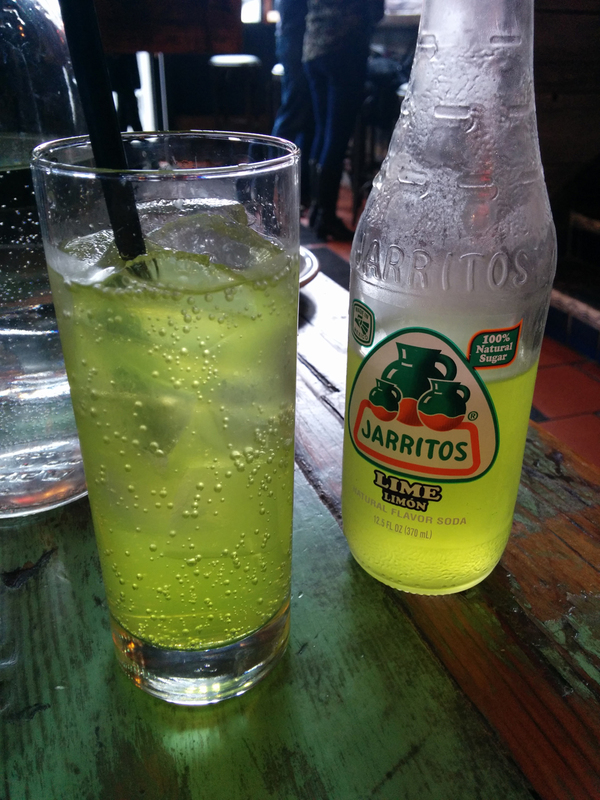 I still think my lime Jarrito’s soda was better, but that is just my love affair with soda.